Fernando M. Treviño became chancellor of Southern Illinois University Carbondale on July 1, 2007. Prior to his appointment at SIUC, Treviño served as dean of the School of Public Health at the University of North Texas Health Science Center in Fort Worth, Texas. He also served as director of the Texas Institute for Hispanic Health in the School of Public Health and has served as director of the school's Institute of Public Health Research. From 1996 to 2000, Treviño served as professor and chairman of the Department of Public Health and Preventive Medicine in the Texas College of Osteopathic Medicine, part of the University of North Texas Health Science Center. Treviño is a past president of the World Federation of Public Health Associations in Geneva, Switzerland. From 1993 to 1996, Treviño was executive director of the American Public Health Association in Washington, D.C., and executive editor of "The Nation's Health." 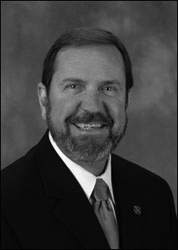 From 1991 to 1993, Treviño served as dean of the School of Health Professions and professor of health administration at Southwest Texas State University. As dean, he was the chief academic officer of the nation's largest school of health professions, with 2,000 students majoring in one of 11 different health occupations.